the holbrooks have a dinner table! 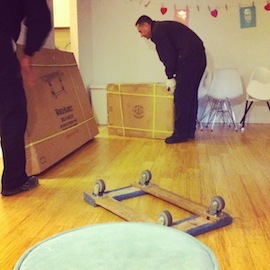 we decided it was time to find a dinner room table when we signed the lease on our apartment last year. we have the perfect little dining area here, so rare in the city! but if you'd have asked me a month ago, i'd have told you it honestly was never going to happen. because first i had to find a table that i liked. then i had to convince the red haired one that it was THE TIME. here we've been married going on nine years and we've never had a table before, so why NOW THIS MINUTE? you see how that snags? then there's the matter of the price. we had enough ear-marked that if a good table were to go on sale, we could afford it. otherwise we were buying an upper lower class table. so it became a waiting game. when a table i liked went on sale, it got even more tricky, because brandon is slower to decisions than i am, and by the time he'd say yes to a table on sale the table would no longer be on sale... aaaaand we'd be back to the drawing board. then there were a few "sure, get the tables," followed by a few "oh gosh, but am i SURE?" followed by a few intense chickening outs. but then, i found her. and then, she went on sale! a REAL sale. we pounced. well, first we discussed it for a week and then brandon said okay but then i stalled on it so then brandon said YOU HAVEN'T ORDERED IT YET? so then i said, I THOUGHT WE WERE STILL DECIDING? to which brandon went DRAMATIC EYE ROLL . . . and then i pounced. and now she's here! oh table my table! last week i had the chance to break her in properly with a little tea party. 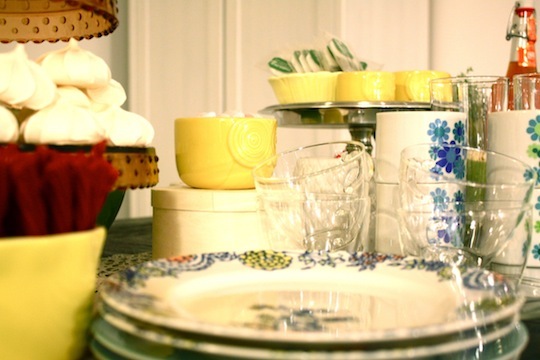 i got her all dressed up in my mismatched china from idaho. our chairs are these guys. i sort of have to restrain myself from putting a sheep skin on every single surface in my house these days. the rug is a vintage 1950s camp blanket i found at the brooklyn flea market a few weeks ago. it's the perfect look, but it's not actually a rug. right? so it's completely temporary until a real rug manifests itself somehow. something i won't worry about damaging. maybe something like this? one of my guests is gluten and dairy and (mostly) sugar free. after reading a lot of labels, basically i couldn't find anything. 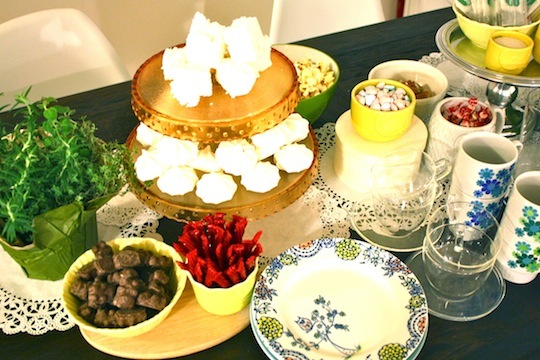 hooray for twizzlers and marshmallows and merengues, which are kosher in just about every diet imaginable. and i felt so proud of my table. aww, proud mama. many thanks to mara, jenny and the komenda girls for the excuse to gussy up! p.p.s. the left over decorations turned our french toast into quite the party the next morning. Aw! That table is stunning and that looks like the perfect evening!! Hydrangeas! They die so fast! I had a friend who had them in her bridal bouquet and they were sad and droopy by the end of the night. So sad, hydrangeas! Wow your apartment in really coming along- so refreshingly pretty! Girl you are LUCKY to have such a big beautiful dining table in this city. Cheers! I love the table and have been eying that bad boy for awhile! I don't know why, but the other links don't seem to be working for me? ANyhow- lurve it! This makes me so happy that one day, I too might have a real table! Beautiful! Oh my! It looks beautiful. I am also a lover of sheepskin. Why can't we cover every surface?? That is an awesome table!! I have a counter height one because I have a sneak sneaky food stealing dog....but I love for a nice long farmhouse table! that is the most amazing table and set up, ever! LOVE IT!!! All of it. Especially the mix of traditional and modern pieces. I wish I could stop drooling over your style and blog. I want to be friends! Your table is quite beautiful! But I am in LOVE with those chairs. I have been on the search for months now. I clicked the link- but it didn't work. Would you mind sharing the link again! Thanks! About the hydrangeas.. hydra=water, hydrangeas=insane water lovers! I've heard rumor, from a very reliable flower salesman, that if you lay them in a tub of water they'll perk right back up. Maybe try that! - I have never heard of alum, but I may just buy someone now. Congrats on the table! A piece that will carry so many memories. Great looking table! I love the "dramatic eye roll" from your husband. I get that from mine all. the. time. You can order any Ikea product from the HOuston store, and they will ship it to you lickity split, and super cheap. Anything. Really. What a gorgeous find, the legs, oh her legs! ;) I love the fur cover and rug combination. Well played Natalie. the links don't work and now i want to know, WHY? and, also, i love it! Love the table. I never think to look at World Market for furniture, but they have some great stuff. Nice mix of the MCM chairs and old-world style table. hahaha love this! the table is gorgeous girl! i love love love that table. reminds me to keep world market in mind when i'm searching for furniture. with the rug and the sheepskin it's a very nice western look. She is so pretty--your table that is. Today we confirmed a new lease and now I need a table--I will be living somewhere with a kitchen that is big enough to have a table in it--So excited!!! 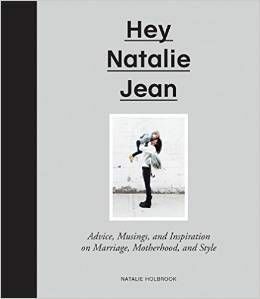 Nat, The first time I order Hydrageas they did the exact same thing, we're talking $200 worth! So I scowered the internet for a fix and what I found was...you have to re-cut their stems under running water or they get an air bubble in the stem and therefore can't absorb the water. So after cutting them under running water, run an ice bath in your sink or tub (basiaclly really cold water then add ice) submere them completely. I got a bath towell completely wet and the laid it on top of the flowers. Then I left those expensive wilted flowers over night, and in the morning it was like an Easter miracle and they resurrected! Not only were they resurrected but they lasted for well over a week! Good luck next time! P.S. Mad love for the table! Pretty please, will you show a close-up of the very pretty things hanging on your wall? I want to see what you have hanging up, and know whether you made that clothespin hanger yourself! Oh my goodness...this is just about the cutest thing ever. Congrats on the new table! Isn't it wonderful to have a piece of furniture that you absolutely love?!? 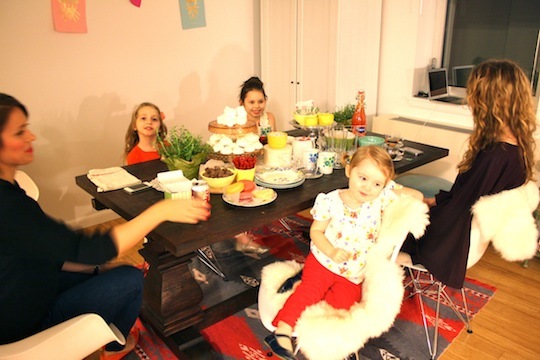 LOVE the table, and a tea party seems like the perfect way to break it in! We've got this rickety stickety table thing my grandpa gave us when we moved into our place. We literally dragged it into the apartment, covered in desert and creosote. It doesn't stand evenly, so we've got Styrofoam under the uneven side and a stick holding up one of the folding leafs. It still wobbles, and even the table cloth cannot completely hide the uneven surface. Needless to say, I am experiencing table envy. Your table is gorgeous!! 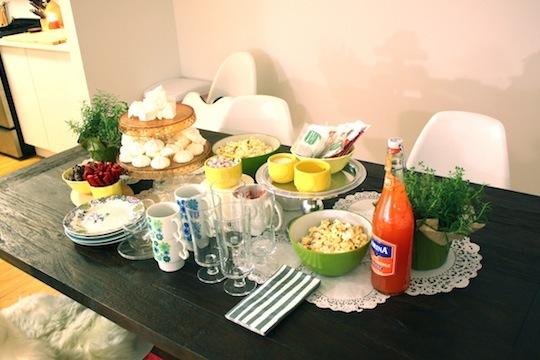 The spread is lovely! but I'm pretty sure Twizzlers are made with gluten aka wheat flour just for future knowledge. I hope for my sake they're not anymore, because oh how I've missed licorice! :D ha Road trips just aren't the same without it. are those chocolate covered cinnamon bears!!?!??? PROVOOO!!!! I adore your blog! Stumbled upon this jewel this weekend! Nice, nice. 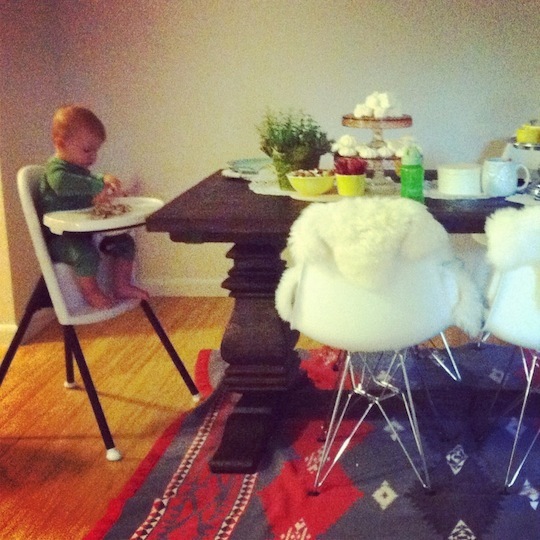 I've basically been drooling over that table since its first Instagram appearance... Oh, furniture lust, damn you! wow..that's one huge beautiful dining table! love it!!! Congrats on the table! I can't wait to have one that fits more than 2 people. You chose well--it is so lovely! Great space. Is Huck's high hair the Baby Bjorn? Just curious and wonder if you like it. I'm considering it for my baby. You should try a rug pad under your camp blanket to make it a little sturdier and to help keep it in place! Melanie...I think she did a review of that high chair on Babble a while back. i have just the trick for you the next time you buy hydrangeas! before you put them in a vase, cut the ends and dip each stem in boiling hot water for 10 seconds before you put them into the cold water and viola! they will last much longer and won't droop! it took lots of research to finally find something that works but i've done it a million times now and it has never failed me! Love your table, World Market is the best. 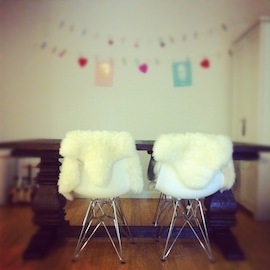 So love your chairs, and Ikea mini sheepskin throws are amazing. Where did you get your chairs? Link did not work, please share! 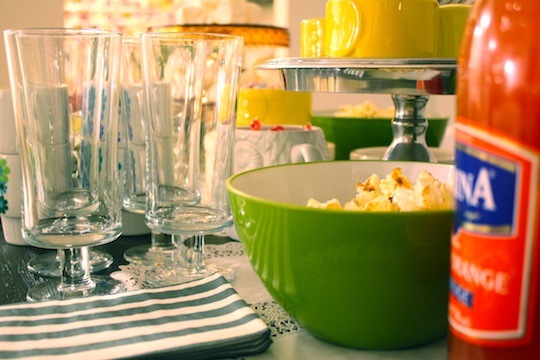 Enjoy your table..so fun to merchandise it with new stuff. As for the Hydrangea's so annoying, try to recut and soak in cold ice bath. "i basically have to restrain myself from putting a sheep skin on every single surface in my house"
The hydrangeas just needs some water. They will perk right up. 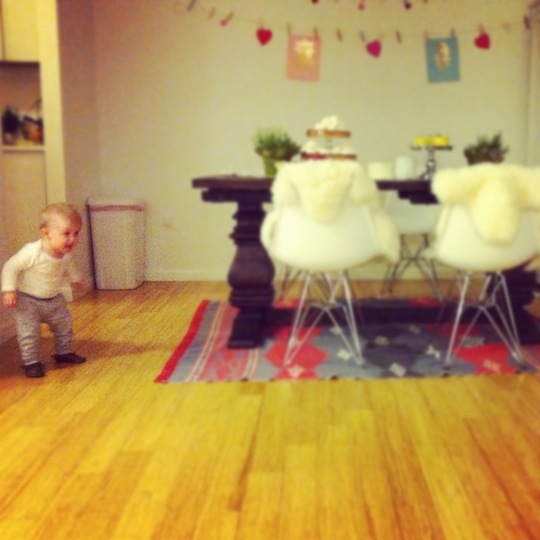 That table reminds me of the saying 'the elephant in the room' with its big ol' legs. Dont get me wrong, its a great table, and I rather love elephants, it just makes me giggle! nice find on the holbrook family table! 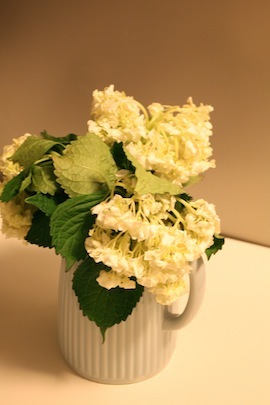 Try smashing the stems of your hydrangeas and then putting them back in water. All your links except the table one aren't working :( I'm curious about ikea on amazon! Great table! Cheers to all the new memories you will make there! Love that table and chairs!! Adorable! We have a lot in common... We live on Rosevelt Island, have a baby boy, and I'm LDS. Anyway, you are too cute. Love your blog. Wanna have a baby play date sometime? Ha!! 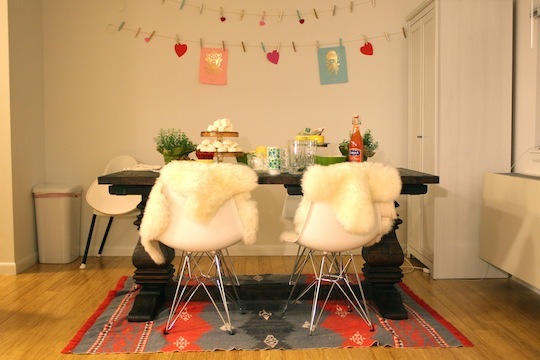 Your dining room is so adorable and well designed. I love that table with the modern chairs. 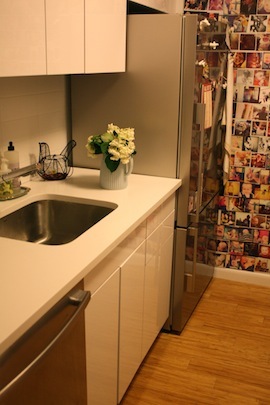 Is that a wall of photos in the kitchen? How I love it! Not to mention the Navajo rug. Nice table! I love your little owl plates...where did you get them? I have been eyeing the WE owl measuring cups, and after seeing them on your table, I have to get them! Wonderful table! I love your post. I have to get them!